SPSS uses a handful of hidden variables for keeping track of things. These so called system variables have names starting with "$" and can be useful in some cases. 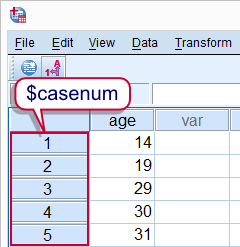 The most important one is $casenum, the number shown next to each case in the data editor window. In the left outline of the data editor window (under Data View) we see a number next to each case. This number is internally known as $casenum. To some extent we can use $casenum in normal SPSS commands. We can also convert it into a regular variable. This can be used to create a unique row id if this is absent. The syntax below demonstrates this. *2. Use $casenum in regular command. compute first_case = $casenum eq 1. *3. Convert $casenum to normal variable. SPSS starts at the first case. Since its $casenum is not greater than one, it's deleted. The second case now shifts up one row and is thus assigned $casenum 1. Since the second case's $casenum is not greater than one (anymore), it's deleted as well. Now the third case shifts up and gets $casenum 1. And so on. A second system variable that may sometimes be useful is $time. This is hold the current date and time. As with $casenum, it can be used straight away, for example in DATEDIFF. Alternatively, its value can be passed into a regular variable as demonstrated by the final syntax example. *1. Create single case test data. *2. Compute now = current date and time. *3. Display now as datetime variable. SPSS uses more system variables than $casenum and $time. Consult the command syntax reference for a complete overview. still using your tutorials and still find them very useful. In this one I again found an answer to my question. Just wanted to say thanks!